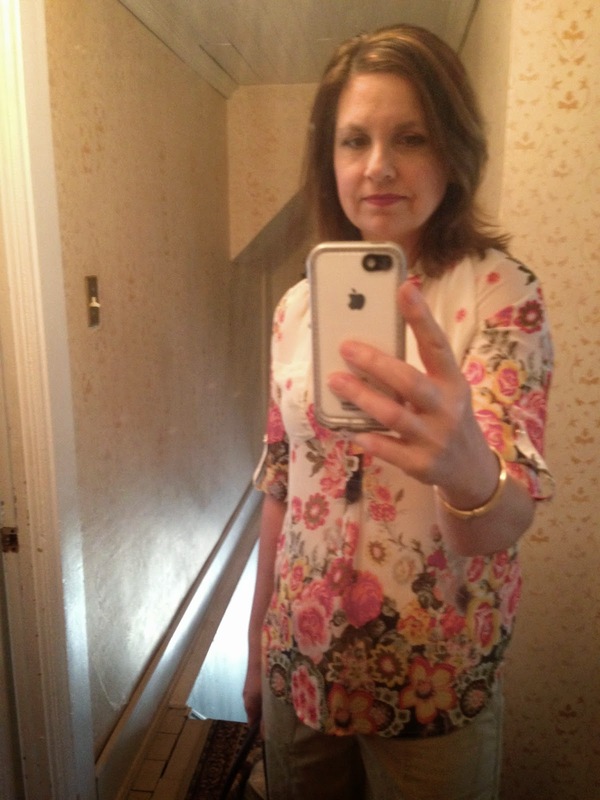 You may remember this floral blouse from Francesca's from THIS POST. I always like to link to past posts if I'm showing an item I've posted before, because I like to show you many different outfits you can create with one item. Because it was in the upper seventies on this day, I chose lightweight cargo pants from JCP, and skipped the jacket. Even with sandals, and a sheer blouse, I was still too warm. I actually saw a lot of people wearing tanks and shorts that day, but that would not have been appropriate to wear at the Jazz Fest. I'm still experimenting with these downward selfies…someday, I'll get it. Bear with me! This blouse is super sheer, so obviously you have to wear a tank underneath. But it is nice in warm weather, when you need to be covered for the occasion, to still be somewhat cool. Because the pattern on the blouse is so busy, I chose very simple jewelry like this multi-strand, gold chain necklace and simple gold bracelets. My son had some items he wanted me to bring to the Jazz Fest, so I chose to carry this large tote so I could fit everything he needed, plus everything I needed for the day, inside. You will never believe where I found this cute tote: Stein's Garden Center in Milwaukee, WI. And can you believe I only paid $11.99 for it! Score! 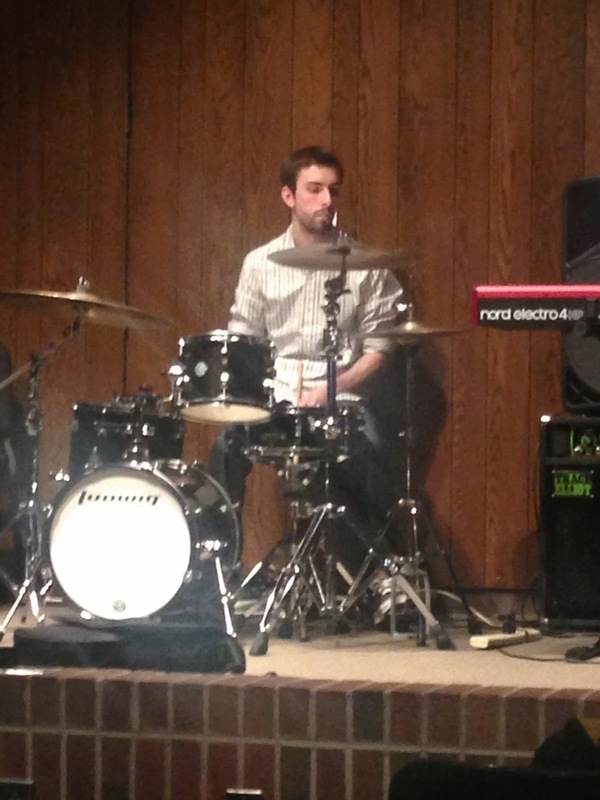 And here is a picture of my son performing at the Jazz Fest. We were so proud of him! Linking Up with: Passion for Fashion, Casual Friday, and Fashion Should be Fun! Your floral blouse is so pretty! 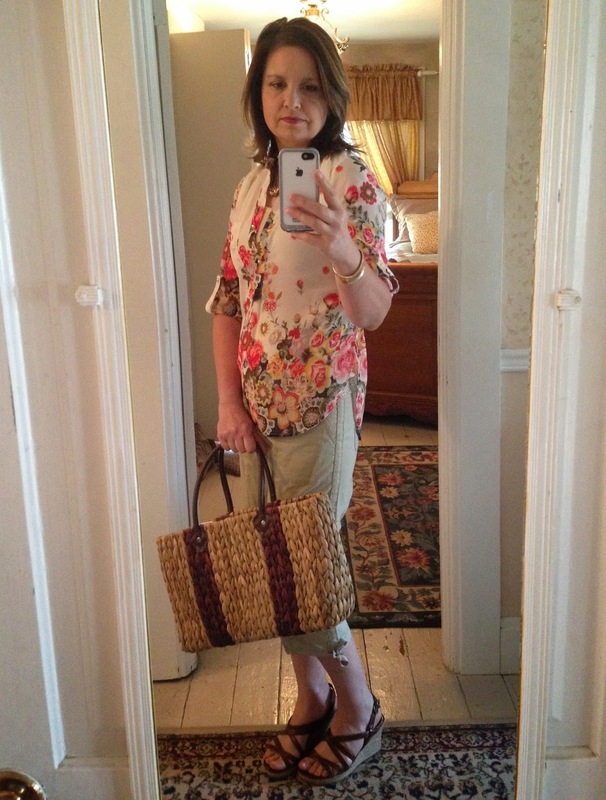 Love your woven tote! Have a great weekend! I am totally the same haha! I only wear real clothes on the weekend, and even when I go out during the week I just throw on some sunglasses to cover my makeup-less face and whatever comfy clothes that will suffice. I love that top, that is so pretty! Yay for your talented son and yay for that fab tote! I want it! Have a wonderful weekend and thanks so much for linking up! And again ..... Very nice Amy . Have a nice day also. Great outfit for a warm spring day! Beautiful blouse! Hope the warmth comes back soon! Your son looks so focused, I bet the performance was fantastic!